Since we got to Patagonia, we took a bus from Punta Arenas to El Calafate, Argentina. We drove northward, along the Andes Range, in the Patagonian steppe, the rain shadow of the Andes. It is a treeless scruby dry expanse of nothing in all diretions, and it is very windy. We drove for 8 hour total, on two busses. When we finally got to El Calafate, we walked to our hostel, which is on top of a hill. The city is next to Lake Argentino, the largest lake in Argentina. It is fed by the glacier of the Andes, which are part of the Patagonian Icefield, the 3rd largest ice mass in the world, after Antarctica and Greenland. It is milky grey and blue, and it flows across the country into the Atlantic Ocean. Today, we visited Perito Moreno, a glacier which is accessible by car or bus. We left our hostel at 8.30am and took the bus, about an hour and a half towards the mountains. The glacier is inside Glacier National Park, Argentina. 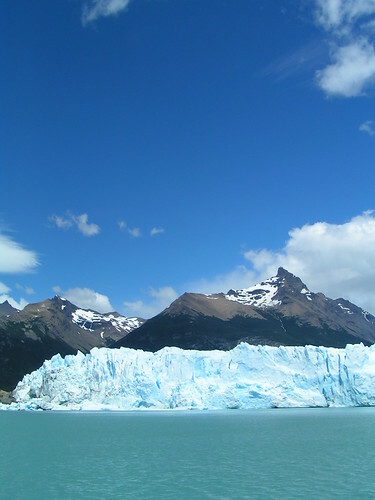 The glacier comes out of the mountains and melts into Lake Argentina. The glacier face was huge, about 60 meter above the water´s surface! The face was 5km wide. Chunks were falling off and crashing into the ice, making a lot of noise! You can walk on land and view the glacier, which we did. You can also get a ticket for a boat which sails 300 meters away from the face, back and forth. We took the boat too. It was soooooo nice, and from that angle, you could really see how huge it really was. It is advancing about 2 meters every day, but it also melts 2 meters everyday, so it is stable for now. Merry Christmas at Fitz Roy!